Women who are 5 feet 8 inches tall have ideal body weights higher than women of shorter statures. Normal weights for women who are 5 feet 8 inches tall are determined using frame size, activity level and body mass index, or BMI. Women who maintain normal or healthy body weight have reduced risks for developing chronic diseases, such as heart disease and diabetes. Women with medium-sized frames, who are 5 feet 8 inches tall, have an ideal body weight of 140 pounds, according to the University of Washington. Add 10 percent – equivalent to 154 pounds – for large-framed women and subtract 10 percent, which is 126 pounds, for women who are 5 feet 8 inches tall who have small frames. Use your wrist circumference to determine your frame size. Women who are 5 feet 8 inches tall are small-framed if their wrist size is less than 6.25 inches, medium-framed if their wrist is 6.25 to 6.5 inches around and large-framed, if their wrist circumference is more than 6.5 inches, according to MedlinePlus. Women who are 5 feet 8 inches, who have large amounts of muscle mass, such as bodybuilders, may weigh more than general guidelines suggest but still be fit and lean. This is because muscle weighs much more than body fat. If you work out regularly and your BMI is 25 or higher – which is classified as overweight or obese, then see your doctor to determine your individualized disease risks. You may also opt to see a personal trainer who can estimate your body fat percentage. The American Council on Exercise suggests that women athletes often have 14- to 20- percent body fat, and that women are considered obese if they hold more than 32 percent body fat, and that the minimum healthy amount in women is 10 to 13 percent. 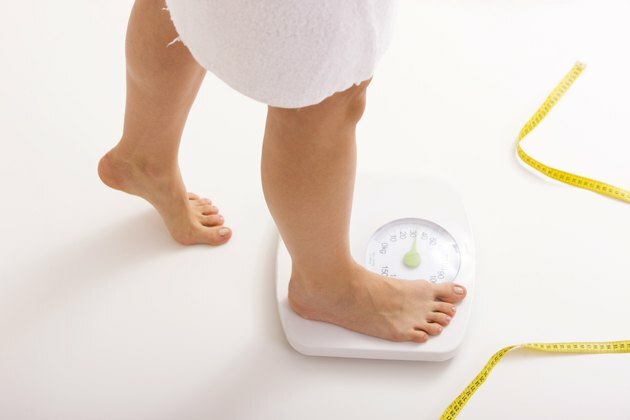 Women who are 5 feet 8 inches tall who are overweight or obese and shed pounds will significantly lower their disease risks -- and may boost self-esteem and energy levels. Reducing calories is a good place to start when trying to lose weight. Women who weigh more than 164 pounds – or those who exercise regularly – need 1,200 to 1,600 calories daily for effective and safe weight loss, suggests the National Heart, Lung and Blood Institute.